When most people create business partnerships, they focus on potential opportunities, their office, titles, mission statements, stationary, logos, social media platforms, and more. 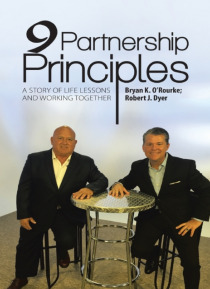 But entrepreneurs Bryan O'Rourke and Robert J. Dyer know there is much more to establishing a successful partnership. The founders of Fitmarc, which is a strategic partner with a variety of leading global fitness and we… llness players, share nine principles to success in this guide to improving life at work and at home. Whoever you're considering as a partner, values and character should be at the top of the list. You must openly discuss your views without fear of reprisal-and if you can't-you need to ask yourself why. It's also important to realize that no one has the right answers. But you do need to ask the right questions if you want to succeed.